Steak and whiskey — it’s a classic pairing that’s existed for generations. 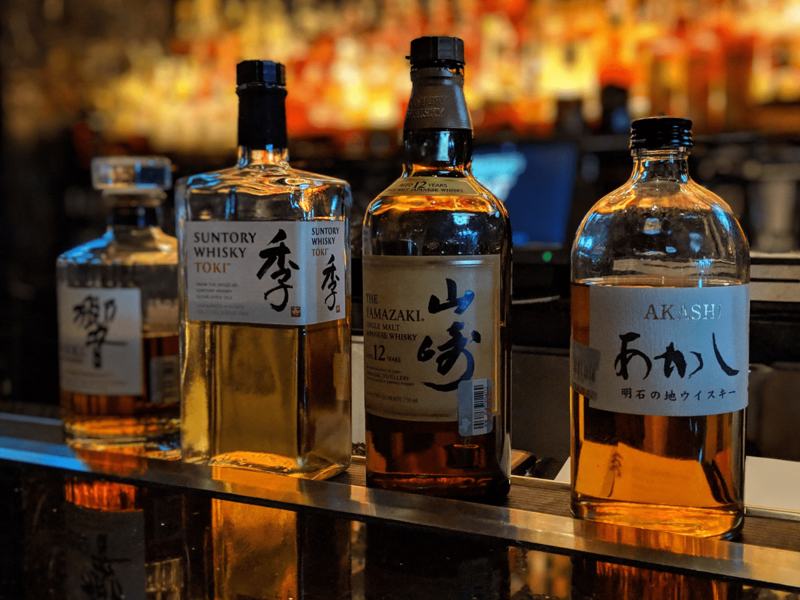 It’s rare to find a steakhouse without a lengthy whiskey list, but Mastro’s Steakhouse has taken its love affair with whiskey to the next level. 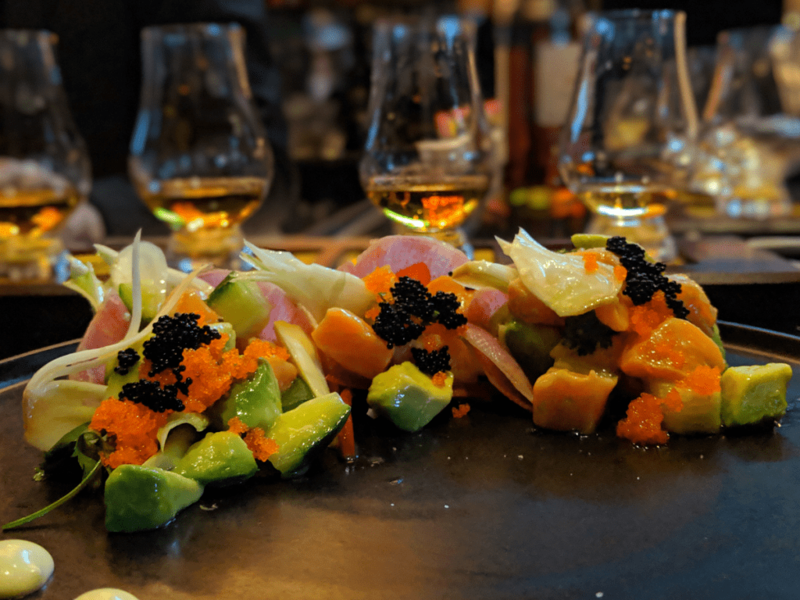 It’s with that spirit in mind that Mastro’s has launched its monthly whiskey pairing series. April’s selections focus on Japanese whiskies Akashi White Oak, Hibiki Japanese Harmony, Suntory Whisky Toki and Yamazaki 12 Year Old. A flight of all four costs $45 and is available at the bar only. Toki and Hibiki Harmony are blended whiskies from Suntory’s three distilleries: Yamazaki, Hakushu and Chita. Diners may be familiar with Toki as it is commonly used in Japanese Highballs. Toki’s slightly citrusy and spicy taste is a wonderful way to wake up the palate. Harmony tastes more of orange, apricot and other stone fruits. White Oak, another blended whiskey, evokes hints of toffee, butter and oak. Yamazaki is a highly-decorated single malt whiskey and has been mentioned many times in Jim Murray’s Whisky Bible. Notes of dried fruit, honey and a slight spice show exactly why it’s next to impossible to find this bottle at the local liquor store. Executive chef Michael Colbert has created three suggested pairings, also exclusively available at the whiskey bar. Colbert’s salmon poké features New Zealand Ōra King salmon flown in fresh daily and is $25. Colbert cures the fish with rice wine vinegar in lieu of traditional soy sauce. The salmon is accompanied by avocado and fish roe. 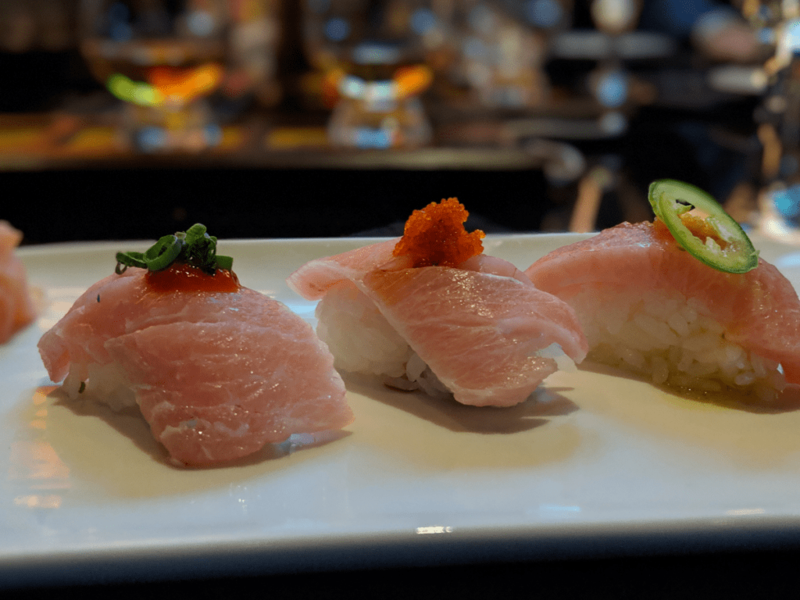 Colbert also offers a plate of toro nigiri — three pieces of fatty tuna belly. The fish is flown in fresh from Hawaii and has never been frozen. The $35 nigiri brought vibrancy and a velvety mouthfeel to the Toki that I’ve never experienced while drinking this Japanese classic. The gold medal winner, though, is the A5+ Wagyu Sando. This A5 wagyu is the pinnacle of beef, attaining the highest beef marbling score (BMS) possible. Colbert coats the beef with breadcrumbs and deep fries i quickly in sesame oil. 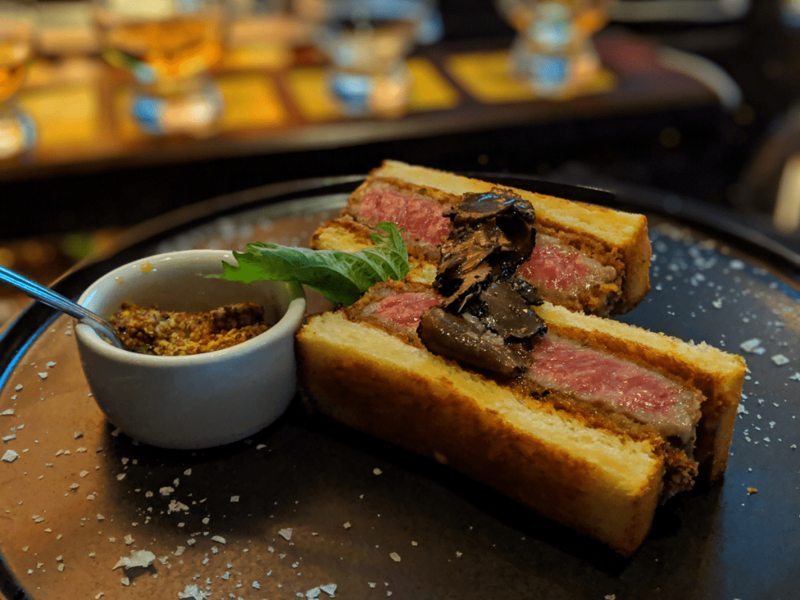 The sandwich is served with black truffles and housemade stone-ground mustard. It’s not often that we’ll recommend a $60 sandwich, but this is worth every single penny. The whiskey flights will rotate monthly as will the suggested food pairings. Mastro’s Steakhouse is located at 1650 West Loop South and is open Mondays through Fridays from 5 p.m. to 11 p.m. and Sundays from 5 p.m. to 10 p.m.